While you might not want your kids to grow up, deep down you know that one day they will want to get out to a place of their own. No one wants to find out that their thirty-something child is living off a diet of toast and baked beans, so teach your kids to care for themselves as early as possible. For a few ideas, read through our top tips on ensuring your children are self-sufficient long before they fly the nest. This skill will come in handy when you're faced with teenagers who go through several outfits a day. Young kids can help hang things up to dry, and as they get older you can teach them about separating colors and whites and how to use the washing machine. To make chores easier on them and you teach your kids how to use it properly to avoid any shrunken clothing in the future. You’ll find that kids start to pick up some good habits pretty quickly if you turn daily chores into a game, as they won't realize that what they're doing is a boring task rather than a fun new activity. Children tend to learn through repetition, and starting early should make it stick. If they’re already a bit older, try giving them some responsibility for cleaning up the house. Make it seem like they're involved in the decision by offering them the choice about which chore they’d like to take on. Start by letting younger children help to put their lunchboxes together, and slowly progress to asking them to stir the pasta sauce or cut vegetables. This helps to teach them the basics and with any luck they’ll pick up a few tips as they watch you work. Get them to help you out once a week and praise their efforts to give them confidence. It’s also a good idea to invest in a few reliable cookbooks that you can give to them when they’re old enough to move out. It’s important to give your children a weekly or monthly allowance, and to not buy them too much on top of this. Ideally they should be encouraged to be as self-sufficient as possible, using this money to pay for phone credit and any trips out with their friends. They should also be taught about the importance of maintaining a savings account, so help them set one up as soon as possible. Even if it means that they’re only putting in 50p a month, everything is relative and it’s still a good way to teach them about monitoring money. However old your kids are, it's crucial to set the right example from the beginning. 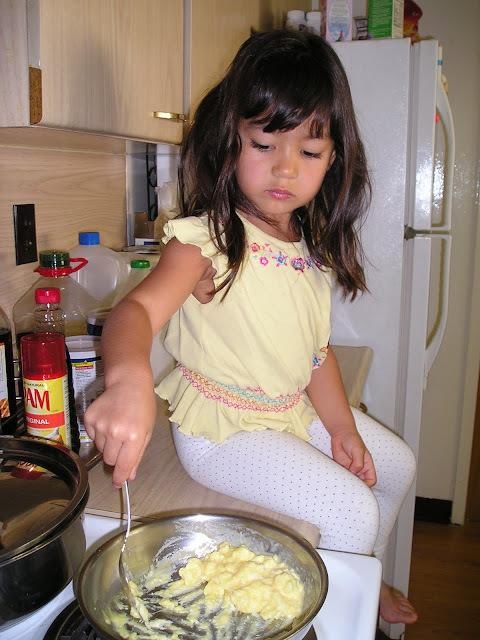 While it might be the last thing you want to do after a long day at work, teaching them how to cook and clean now will mean that when they do start to head out on their own, you can be sure that they know how to fend for themselves. How cute! 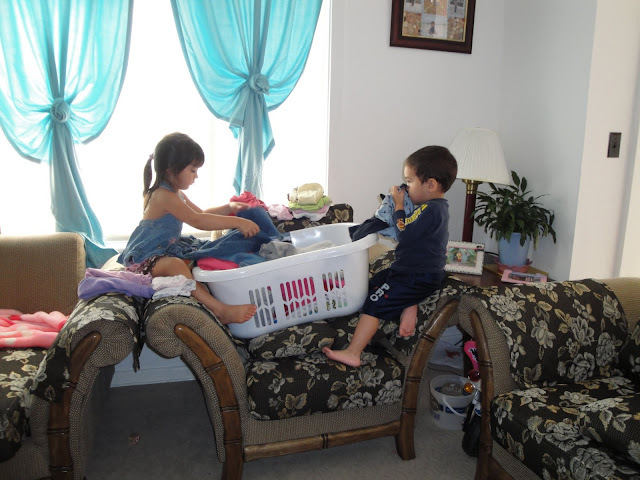 love the photos, especially the one with them by the clothes basket how cute!! great post! I have a teenager. I wish I had started him earlier on some things...the downfall of one child where it's sometimes easier to just do it. love the pictures and reminder! Aww, they're so cute. They are a little bit younger here. Great tips. It's really important to teach kids self-sufficiency. It's one of the greatest gifts that a mom could give to her kids. There are very good tips. Everything makes sense. I also impart these to my daughter. So many great tips. My kids have that same piggy bank, such an awesome way to teach them to save and to give back to the community. Now if all parents did this, we would have a great generation ahead of us! I also teach my kids the importance of helping around the home and chores as well as the value of a dollar! 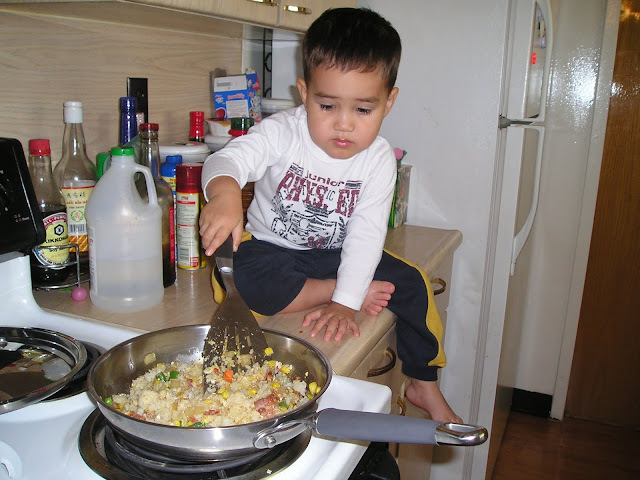 I was always told not to let my children cook when they are young because they could get hurt. I love seeing I am not the only one that thinks it is a good idea. If they are supervised, you are teaching them a life skill. How gorgeous the helpers are! Lovely kids! Wow! Good training :) every kid should learn this because its for their own benefit as they grow up. They are so adorable. Letting them do what they want to try to do (under supervision of course) is the best way for them to learn. I'm sure you are a proud mom! You've trained your kids well and I'm sure they will grow up to be responsible adults.